I've been working with a dog that enjoys tracking every piece of mud from the backyard into the living room, and of course I can't help but take pictures of her poor little soul. That face...how could you possibly get annoyed with a look like that gazing up at you? I promptly forgot to clean up the dirt, and it didn't get taken care of until my sweet guy saw it and took care of it. One thing I did remember to take care of, though, is designing a new logo for some of my dearest friends who run and own Chic Shot Studio, a wedding photography business based out of Florida. We're right in the middle of the design process, and I'm really hoping we can stay on schedule to finish by the end of the month. Since this work has been revolving around weddings, I got sucked into the vast spiral of looking through countless wedding shots. 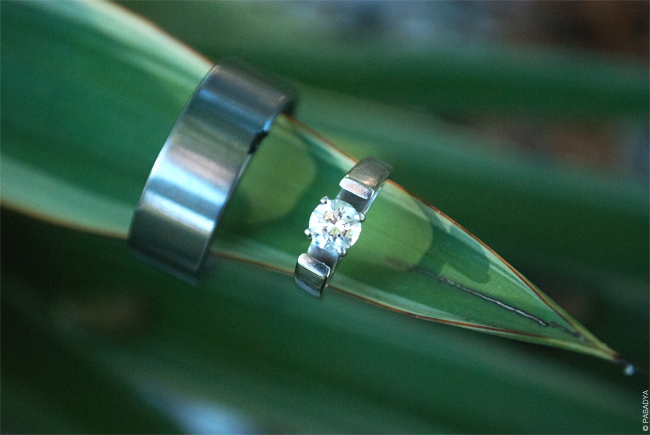 Consequently I became inspired and couldn't resist forcing Clay to give me his ring when he came home from work yesterday to take shots of our rings on one of the most dangerous plants we own. It's a gorgeous plant, but those pokey spikes attack me every time I get close to it. Oh, the pain. SO worth getting a pretty shot, nonetheless. Naomi, she's such a stink. It was wonderful, thanks! Looking forward to catching up with drawing and sharing the logo.